I’ve made a lot of apple pies over the years, but tonight I felt like making Apple Galette – a slightly different variation of a classic dessert with a French twist. 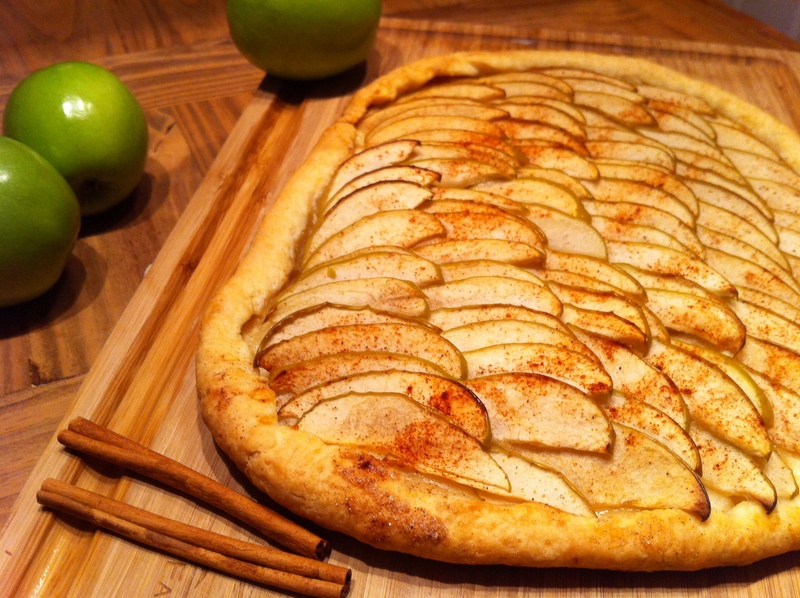 It tastes similar to apple pie and isn’t really any more time-consuming to prepare, though the galette’s presentation is much more elegant. Whenever I think of apple pie, what comes to mind isn’t exactly Thanksgiving or holidays as one might expect. I’m usually brought back to the memory of two vociferous budgies I once owned and to an old friend from my days at the Royal London Wax Museum. I used to bake this friend apple pies in exchange for his frequent bird-sitting services whenever I went on vacation. The year that I started working there, I had just finished reading The Woman in White by Wilkie Collins and was intrigued by its Napoleonic villain, Count Fosco, whose eccentric habits included taming canaries and perching them on his shoulders to sing sweet songs in his ear. Young, misguided and easily impressionable, I thought that taming canaries would also be a sure-fire way to impress a prospective girlfriend I had invited for dinner that very weekend. I convinced myself how smitten she would be with my feathered menagerie of yellow friends and also with me as their modest but proud father/trainer; so I coaxed my roommate to drive me to the pet store that afternoon. Ignorant of birds and lacking a substantial budget, I ended up with two cacophonous budgies who squawked without pitch or melody all day long, much to the dismay of my neighbours, instead of ending up with the sweet-sounding canaries I had hoped for. The girl never did end up coming over and the only trick I was ever able to teach my budgies was to eat from my hand, a far cry from the Cinderella scene I had envisioned. Whatever apple pie means to you, whether budgies, family dinners or the gratuitous scene from American Pie, try this apple dessert out instead as a break from the ordinary.